Snow depth is also highly variable across the landscape. 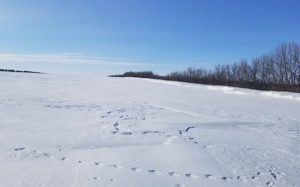 Winter winds can move as much as 75% of annual snowfall away from open, exposed fallow fields in southern Saskatchewan, according to this Fang et al report. And even if snow depth was equal across a field, infiltration of meltwater into the soil tends to be higher in low areas where water pools before moving on. Another study* by A. E. Coles (University of Saskatchewan) et al looked at snow cover across the Great Plains from 1962 to 2013 and found that while snow cover on fallow (tilled) land and overall snowfall in general dropped over that time, snow cover on land with stubble stayed steady. 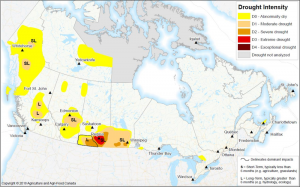 While this snow may not contribute a lot to required moisture for crops (canola needs 2.5cm (1”) of water for every 3.5 – 4 bu./ac. of yield), the early season soil-surface moisture it provides is often essential to good crop establishment. Reduce seed-placed fertilizer. Risk of seedling loss from seed-placed fertilizer goes up in dry conditions. 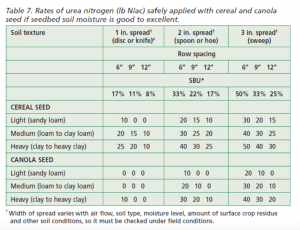 In a dry spring, be more conservative with seed-placed fertilizer rates for canola. Limit seed-placed fertilizer to no more than 20 lb./ac. of phosphate (40 lb./ac. of MAP, for example) and nothing else. *A.E. Coles et al, “Climate change impacts on hillslope runoff on the northern Great Plains, 1962–2013” Journal of Hydrology 550 (2017) p538-548.